Today is Oreo's 100th Birthday! 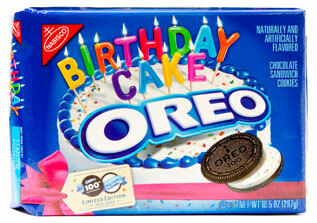 In honor of Oreo's Birthday, Kraft Foods has released the Birthday Cake Oreo's. It's the classic Oreo, however, when you twist open the cookie, the frosting is speckled with colored sprinkles. How yummy do these look? I cannot wait to try these. Have you seen them or tried them? ?